These days many enjoy buying wine with labels that feature animals: kangaroos, penguins, fish, lizards, and loons. These "critter labels" don't just happen by accident -- research shows that American wine consumers are 40 percent more likely to buy a wine with a cute animal on the label when compared to a straightforward label that gives the standard information: the name of the producer, the name of the grape, the name of the place where the vineyards are located, and the year in which the grapes were picked. But whether we choose our wines based on the cute factor or on the basic label facts, most wine labels give us minimal information; it's up to the consumer to know about the vintage, the area where the grapes are grown, etc. Sometimes the back label of a wine is reserved for marketing the wine, and in the process of trying to hook the consumer with spinspiel, we learn a bit more about the origins of the wine and the philosophy of the producer. But there is one wine producer in California whose unique labels actually give us important information (perhaps to the point of overkill), and that is the Calera Wine Company, owned by Josh Jensen. Jensen specializes in Pinot Noir, grown in single vineyards, and for the last 35 years his goal has been to create Burgundy in California, and the labels on his wine not only tell you about the wine, but, as you learn to read between the lines, they can also tell you much about the winemaker's art -- a sense of the level of detail that goes into how and where to plant, harvest, and make wine. 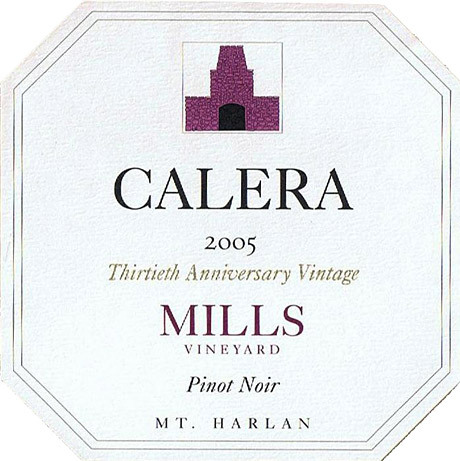 So, it's obviously straightforward: The producer is Calera; the vintage is 2005 (Calera's 30th); the grapes were grown only in the Mills Vineyard; the varietal is Pinot Noir; the American Viticultural Area (AVA), or officially designated wine region is Mt. Harlan. It's the back label of this wine that really excites me, as it is filled with information about the pedigree of the wine (and why it is, in my opinion, absolutely worth $45 per bottle). 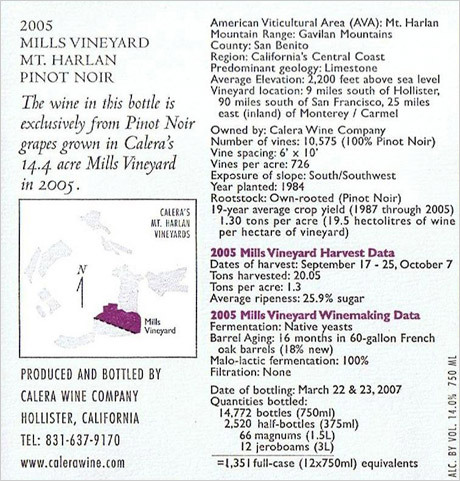 On the left hand side of the label we learn that the Mills Vineyard is 14.4 acres, and we see where the vineyard is located relative to the other Calera single vineyards. We also get some basic contact info for the Calera Wine Company (by the way, the website is terrific if you want to learn more about the winery, its vineyards, and its wines). But it is the right side of the label that makes this wine unique and provides a virtual tutorial in what it means to produce a true artisanal wine from vineyard to bottle. Let's explore this label and see how it translates to what's in the bottle. Where French and Italian wines often refer to their appellations and denominations, we Americans have a much-less well known system of geographic designations called American Viticultural Areas. 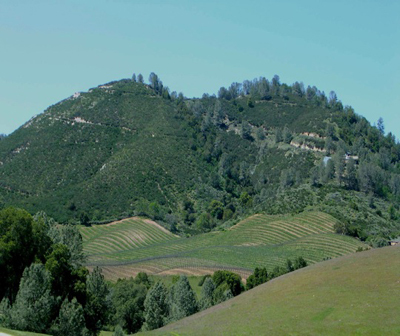 Calera Wine Company is the only wine producer in this AVA, due to its extreme geographic isolation: Gavilan is Spanish for "hawk," and red-tailed hawks are common to this mountain range, whose highest peaks are more than 3,000 feet. This wine is not produced in famous Napa or Sonoma counties, or even in Sideways territory, Pinot Noir-rich Santa Barbara and San Luis Obispo counties. San Benito County is not known for its wines, but it does have a few isolated wine regions, including Chalone and Calera's Mt. Harlan AVAs. After Josh Jensen returned from Burgundy in the early 1970s, he searched for limestone-rich soils for his Pinot Noir vineyards, convinced if he was going to make a Pinot Noir as fine as France's best, he could not do it without the terroir-defining limestone soils. (Calera is Spanish for "limestone kiln.") His search went on for years -- limestone is a rare soil type in California, which is blessed with a lot of overtly fertile loam and clay soils. So these vineyards are close to a half-mile in the sky, and are accessible only by tough-terrain vehicles. At this elevation, all picking in the vineyard must be done by hand. High-elevation, cool-climate vineyards enjoy the morning and afternoon sun to ripen grapes, and also enjoy cool nights that produce high acid levels in those grapes. High acidity in the finished wine makes you want to take another sip of wine, another bite of food. There is nothing worse in the world of wine than low-acid Pinot Noir. This may seem like an obvious and unimportant fact, but it is actually quite important. What this means is that since the winery owns the Mills Vineyard, this wine was made without any purchased grapes. The wine is estate-bottled, meaning that Calera owns the land, grew the grapes, and made the wine. The majority of wines in California are produced at least in part from purchased grapes. These numbers speak volumes about Josh Jensen's approach to growing Pinot Noir. The total number of vines, the vine spacing, and the vines per acre indicate that Jensen believes in a more classic (Burgundian) planting regime, giving the vines plenty of room to grow, and plenty of room for vine roots to extend deep into the soil. By modern standards, which include close spacing of vines, 726 vines per acre is about one-third of what many growers might plant (about 2,000 vines per acre is the modern norm). The relatively small amount of vines, coupled with excellent vineyard management, will provide a low yield in the vineyard, which is what Jensen wants: fewer berries, but more concentrated minerals, flavors, and aromatics in each berry. Much like you want south-facing windows in your home for as much natural light as possible, these mountain vineyards are planted for maximum sun exposure throughout the day, helping to ensure steady and even ripening. Since the vintage of this wine is 2005, the vines were 21 years old at the time of harvest, meaning that the vines are mature, although they still have a long life ahead of them. Perhaps more important than their age is that these vines are planted on their own roots, not grafted onto a selected rootstock. Ever since the plant louse, phylloxera destroyed the vineyards of Europe and beyond at the turn of the 19thand 20th centuries, about 90% of the commercial vineyards in the world have been planted on phylloxera-resistant American rootstocks (Australia and Chile being notable exceptions). Jensen is taking a risk here, but he must believe it is important for the vines of the Mills vineyard to be planted on their own roots (the other four Pinot Noir single-vineyards are all planted on various American rootstocks). The parentage of these vines is also an important issue for those of us who love great Pinot Noir. The vines are said to be propagated from cuttings of the Pinot Noir vines of the Domaine Romanée Conti (DRC), the most famous and revered vineyards in the Côte de Nuits region of Burgundy. Since smuggling these vine cuttings into California is technically a crime, Jensen will neither confirm nor deny the origins of his Pinot Noir vines, but those closest to him attest that the source of Calera Pinot Noir is, in fact, the DRC. I must have read this label entry more than a hundred times, and each time I wonder, "Could this be true?" Jensen's yield per acre is, in the world of commercial grape growing and winemaking, infinitesimal. Growers whose yields are normally in the three to five tons per acre range produce high-quality wine; three tons per acre is considered an exceptionally low yield, especially in California. What this means is that each berry harvested in 2005 in the Mills Vineyard is precious for not only its varietal character but as a dramatic expression of its sense of place, its terroir. Fruit, not being programmed machines, reach desirable ripeness levels at differing times, and so there is no single harvest date for the grapes in this wine, but rather harvest is a process that takes place over a range of dates. Again, the emphasis is on low yields, both in total tonnage and tons per acre. 2005 was a textbook vintage for the Mills Vineyard, yielding exactly the 19-year average crop yield in that vintage. Incidentally, in 2004, the yield was 1.28 tons per acre, but in 2006, a very wet year, the yield was 3.16 tons per acre, still low by industry standards, but quite high by Mills Vineyard standards. Jensen "declassified" 44% of the finished wine that year, deciding it was not high enough quality for the Mills bottling. The wine found its way his into the 2006 Mt. Harlan Cuvée Pinot Noir, a blend of the single vineyard wines and wine made from younger vines. This means that Jensen chose to ferment this wine with the yeasts present on the skins of the grape. While some producers choose to work only with native yeasts, many more choose to work with more predictable, less risky commercial yeasts. All of Jensen's Pinot Noir wines are fermented on their own yeasts. Because of his love of Burgundy, Jensen uses French barriques to age his wine. French oak has a closer grain than American oak, and, in part due to that reduced surface area contact, imparts less powerful, more subtle oak flavors to the wine. By using only 18% new, more aromatic and tannic oak and the rest older barrels, Jensen is using the wood as a spice note in the wine, and not defining it as an "oaky" California Pinot Noir. The wine has great structure and the aroma and taste of oak is delicate, almost a whisper of wood. Nothing unusual; this is a given in red wine making (a choice in white wines). Malo-lactic fermentation is a secondary fermentation that changes harsh malic acid (think green apples) to smooth lactic acid (think milk and yogurt), and in the process lowers overall acidity in the wine. The wine is unfiltered. Jensen is one of a cadre of serious winemakers who believes that filtering wine strips it of essential flavor, aromatics, and complexity. While the wine's color may not achieve the brilliant luminescence so prized by so many consumers, the integrity in the wine is more than worth any slight haze in the color of the wine. Not all wines need to be unfiltered, but this wine benefits from Jensen's non-interventionist approach. Date of bottling, etc: Completing the picture, Jensen lets us know that this is a small production of a fine wine – the equivalent of about 1,350 twelve-bottle cases, more or less consistent with single-vineyard production in Burgundy. Too much information? Maybe. But I find it refreshing that Josh Jensen is so proud of his wine that he wants to share his pride, his passion, and his obsession with the people who are going to drink that wine. I wish that other wine producers who share that pride and passion might follow his lead. And while it's true that this information requires a little bit of context to understand the complexities it points to, it would seem to be easier for consumers to understand the effects of yield, sun exposure, etc. and be able to make educated guesses at the quality of the wine, rather than rote memorization of vintages, producers, areas, and grape types. That information becomes a great sell for the wine, and what better place to do that than on the wine label?